Having worked extensively as a career advisor and an employment counselor in Vancouver’s Downtown Eastside, Chelsea Hunter’s guiding hand has helped many people and many ambitious students find their career. She is now the professional development advisor at the Simon Fraser University’s School of Contemporary Arts as well as the head coordinator of the school’s professional internship program. As an advisor, she is knowledgeable and understanding in the student’s transition to graduation and as a coordinator, she is organized and determined to create opportunities for students to make contact with potential future employers. 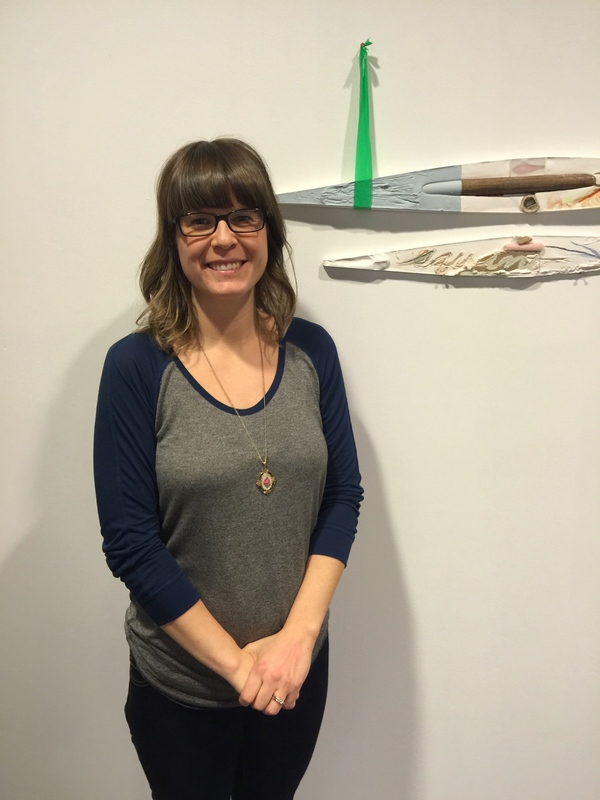 Her forte in creating one-on-one internship opportunities with well-known organizations in Vancouver’s art community have exposed students to invaluable hands on learning experiences and job opportunities. In fact, after graduation, many students that were in the internship program have proceeded to work professionally in the art community. The first time I met Chelsea was a year ago when she attended the SFU Dance Student Union’s annual meeting. That memory specifically stuck with me because she was asking every single dancer in the program if they were interested in having an internship opportunity and whether or not they had any opinions on it. At that moment, I couldn’t figure out why an advisor was putting in so much effort and asking for our opinions when usually students’ feedback are usually disregarded. Now, walking into her office in the SCA main building almost a year later, it was clear right away of Chelsea’s dedication. 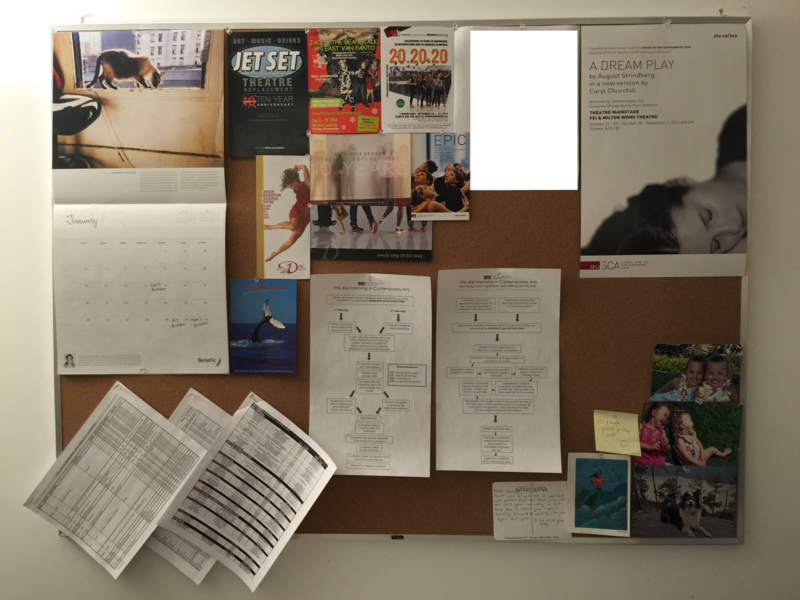 Impossible to miss, her vision board was the first thing I saw and it consisted of her network, current internship opportunities, future possibilities, organizations and specific posters of events that her previous interns had worked on. It is obvious now that she genuinely wants to know what the students want so that she can try and make it happen. The interview was effortless as Chelsea and I engaged in conversation about her background, her current work and somehow ending with her guidance on my personal aspirations. Within the brief time of our interview, I’ve come to see why Chelsea is always booked full with advising appointments- her passion in helping others is prodigious and from the many accomplishments of her interns, it is without a doubt that she is highly successful in doing so. Chelsea Hunter. 2015. Photograph by Betty Meng. Betty Meng: Chelsea, thank you so much for allowing me to interview you. I understand you’re really busy and I’m honored to have this opportunity. For the focus of this interview, I just wanted to clarify with you that I will be asking questions on the Arts community including music, film, visual arts and theatre but with a greater emphasis on the dance community. Chelsea Hunter: Hi Betty, I’m glad to be doing this interview and of course, let’s begin! BM: I understand that you are a graduate of SFU with a degree in Health Sciences and currently pursuing a master’s degree in Urban Studies. Was there a critical moment in life that brought you to the direction of the Arts community? CH: Yes. I was in my last semester of my undergraduate degree and was doing the semester in dialogue. It was a very hands on learning program and from it, you get immersed within a topic and work in the community. This is the moment where I was exposed to community development and different community based organizations like the Arts. So when I started working at SFU and in the role I am now in as internship coordinator, I feel really interested connecting students with hands on learning opportunities in the arts community that can help build the students’ skills and capacity for when they are done school. BM: What inspired you to become a professional development advisor for the students? CH: When I finished my undergraduate, I was lost and did not really know what I wanted to do. You come out of the school with a lot because you did many courses from your degree but not necessarily having any hands on experience or hard skills to transfer into a job. I feel gaining experience is really important and beneficial in helping students to have a better idea of where or what they want to do after school. I really enjoy working with students in exploring that and help build opportunities with the internship program for them to explore that wall. At the end of an internship, they’ll still be a student but hopefully, this way they’ll have a little more of an idea of what they want to do for when they’re done school. Also, I worked as a career advisor and an employment counselor in the Downtown Eastside before coming to SFU. It was quite a different experience working with people who have multiple barriers to employment such as mental health and housing issues but for me, they all build on each other- those experiences and I guess that’s what brought me to where I am today, helping people and helping students. BM: What would you say is your greatest asset to students seeking advice? CH: I would say I totally understand where they’re coming from. I’ve been there as a fourth year student not really knowing exactly where my career path is and when you’re in school, you are very insular in that so when you finish school it’s “Oh now what?” So, I definitely can relate to students because I’m kind of at that point now. I mean I’ve been graduated for about seven years in my undergrad but now doing my master degree, it’s sort of like I’m back in that point. As a student you are always growing and developing so I can relate to the students in that sense. BM: Compared to other disciplines such as music, film, visual arts and theatre, how would you say the dance community is in terms of accessibility of internship opportunities? CH: It’s interesting that you ask this question because the feedback I’ve received from the dance students completing dance internships is that they want to work with choreographers and have a creative aspect. Actually, many of the other students in the Contemporary Arts program have all expressed that they would like to be creatively involved in internships as opposed to the administration side. For example, all theatre students’ want is to be involved and contributing creatively rather than filing paperwork, etc. It’s even more challenging within the dance community because of the organizations itself. They’re smaller, independent choreographers and they don’t always have the capacity to work closely with the student to help them learn or meet their learning objectives. So, many of the organizations that I am connecting with that are dance related may be more on the administration side. This could mean working closely with event planning and working with festivals such as VIDF (Vancouver International Dance Festival) or Dancing on the Edge. They are all very dance related but it doesn’t have the creative component that many of our students want. So, that’s challenging. BM: How do you search for internship opportunities? CH: When I first came into this position, I started with faculty. I connected specifically with each area within the school itself and asked the faculty if they had any organizations that they thought might be interested in working with our students on an one-to-one basis or having an intern help them out with their projects. From then on, I would send emails to organizations and explain the internship program and what our students can do. Sometimes, I would get the connection from another organization’s referral and be directly connected to that person over email. It’s one of those things that are organic and it just happens. BM: What would you say is the most challenging part of establishing an internship opportunity? CH: It is challenging finding and balancing the expectations and the interest of the students with that of what is actually available. I think not just for dance but for all of the areas, what students are looking for in terms of an internship just isn’t possible in the real world. That’s what I’m trying to build up for the internship course- building the capacity of the different skill sets of the students. There is so much value in gaining different experiences that are not necessarily directly related to your practice or art. BM: What is your vision for the internship program you’ve developed for SFU’s School of Contemporary Arts? CH: My vision long term is to communicate to students that there are opportunities for learning in any kind of environment. If they are motivated enough to seek those opportunities whether they’re directly related to their art or practice, I would like to be the one providing those opportunities. I strongly feel that any kind of experience whether you’re sitting in an office, running a box office, getting sponsorships for big events or helping with social media are all important. I mean these are the kind of things that many professional artists have to do even on top of their practice. Also, I want to communicate to the students that yes, this may not be the best internship experience where you are creating a piece and its being shown at this great amazing theatre but it is still equally as beneficial. It is the experience that they are getting through these organizations, their communication, marketing, and development but most importantly, being in their environment. Observing through osmosis of seeing how organizations work and just being exposed to that is of great value. It’s about helping students understand that and through that use the internship as a really good learning experience for writing your resume and cover letter. It’s also important to reflect on what it’s like to work in a team environment, professional community and on what they have learned. Regardless if you are creating or just doing more the administrative things, hands on experience and learning build you as a person and as an artist for work in the community. BM: Recently, I saw your post of the “SCA Alumni stories” on the school’s bulletin boards and social media page. Can you tell me a little more about this event? CH: Back when I first started this position last summer, I wanted to start an event series showcasing students what they are doing beyond their work as a student. In the Fall, it was the “Action Talks #1” event and it showcased two groups of current students who did either hands on internships or projects in the summer that were outside of their course work. One of these groups even worked with the Burnaby Art Council Performance Group. The “Action Talks #1” was an event where they shared with us their experience of the project itself and how their coursework related to their work experience. 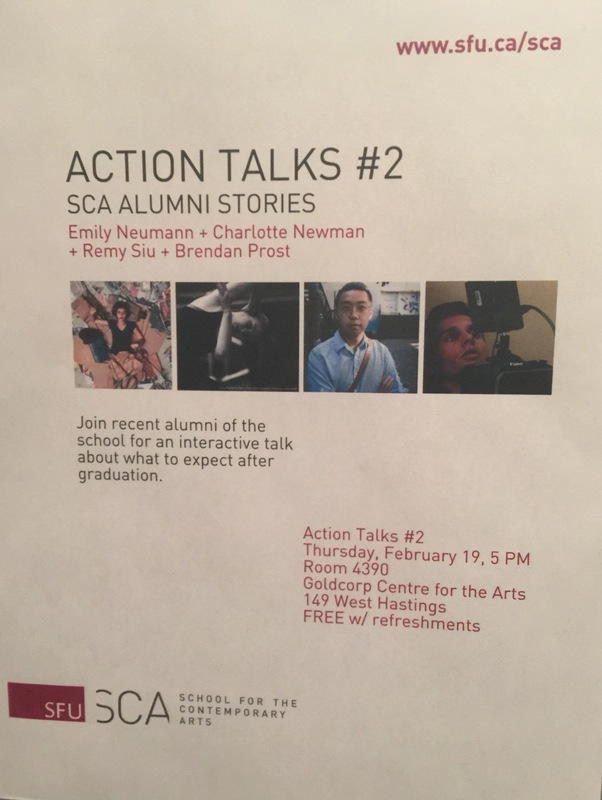 For “Action Talks #2: SCA Alumni stories”, I wanted to focus on students who have recently graduated and ask them questions about what life is like now, what they did as a student that has prepared them for graduation and what they wished they had done more of. I’m hoping this will connect to current students and invite them to come and listen to the experience of someone who had just recently graduated. It will be an hour-long panel with four alumni on Thursday, February 19th. I’ll moderate it with questions and take questions from the audience. They will share what they are currently doing, current projects they are working on, give suggestions or recommendations and explain how they got to where they are today. Chelsea Hunter. Action Talks #2. 2015. Paper. 8.3 x 11.7. Courtesy of the artist. BM: Were those alumni involved in the internship program? CH: Two of them were in the internship program. Charlotte Newman did an internship with the Scotiabank Dance Center last spring and Emily Neumann worked with Zoe Quinn who is in charge of the SFU School of Contemporary Arts web services. Zoe was in charge of publicity of all of the Mainstage shows last year and Emily learned a lot from her. In fact, Emily is actually working publicity for the Push Festival now based on her experience from Zoe. Charlotte is actually working with Music on Main, which is completely different than her dance background, and she sits on the board for a couple different organizations. In this event, we have music, film, dance and production. It really is an array of background and will be interesting to see what they all have to say. BM: What advice do you most often give or want to give to aspiring students developing their career pathway after graduation? CH: To take on different experiences and really reflect on your strengths, interests and also know that just because you did a dance degree doesn’t mean you have to go and be a dancer. Of course, if being a dancer is really what you want, then go for it! Just know that there are other opportunities and many different possibilities outside of your field and you are not at all confined to one field. Being open and having an open mindset is a really big thing. Try and be involved with different organizations, communities and network. Networking is key. If you have an idea of where you want to go, do some research! Know who is in that field, connect with them and talk to people. Put yourself out there, that’s the only way to market yourself. Tell them what you’re interested in and be really open about who you are and what you want to do. There are countless opportunities out there, you just have to make it happen! BM: Thank you so much Chelsea. This really gives me a great perspective on your work and the internship program. I hope to see you soon at the Action Talks!